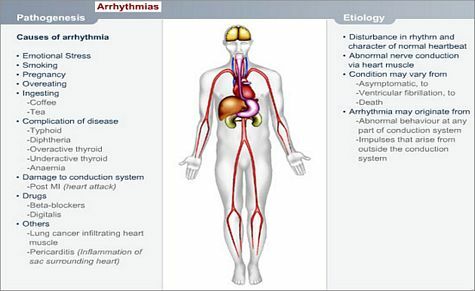 An Arrhythmia is a disturbance in rhythm and character of the normal heartbeat. It is associated with abnormalities in nerve conduction of impulses through the heart muscle. 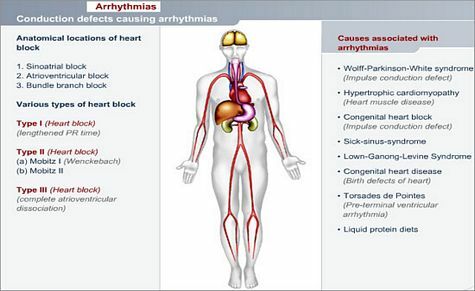 Arrhythmias may originate from abnormal behaviour at any part of the conduction system or from impulses that may arise from outside the conduction system, such as heart muscle fibres. Why does this happen and how may it affect the patient's health? It may happen as a result of damage to the conduction system because of diminished oxygen supply to that area (secondary to a heart attack). It may also be caused by cancerous growths from other organs e.g. Patient may experience abnormal heart palpitations in chest. The heartbeat will feel irregular (sometimes fast; sometimes slow), but the patient will normally become more aware of it when the heartbeat is faster. It may be associated with fainting or the feeling of wanting to faint due to lowering of blood pressure; the patient may experience chest pain during these episodes. An Electrocardiogram (ECG) will clearly show any abnormality of the heart rate and rhythm. 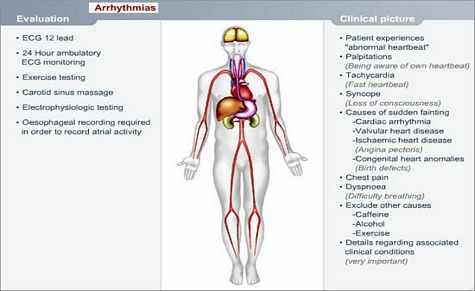 There are a number of specialized ECG tests that can be done, other than a basic twelve lead ECG in order to determine the exact type and cause of an arrhythmia. A positive family history is important information to obtain; also ask patient regarding what medications he/she may be using. A thorough risk assessment by a heart specialist. 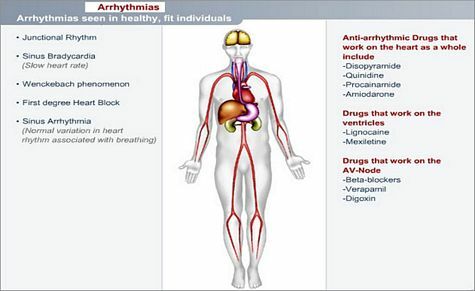 There are a large variety of abnormal heart rhythms and each one has its own specific treatment protocol.